Sunscreen isn’t just another skincare product. You get it wrong; it may give you a pimple at worst. Sunscreen is medicine for your skin. Use it the wrong way and you’ll look 10 years older. I have heard some people saying Sunscreens are a cocktail of chemicals and it’s more damaging than the UV rays. But the reality is not every other sunscreen is damaging, when you spend some time researching, you can actually find some good sunscreen that will protect your skin without harming. Also, some say our grandparents didn’t use the sunscreen and they had great skin. But during our grandparent’s time, the Ozone layer was protecting them but now it’s not the case. 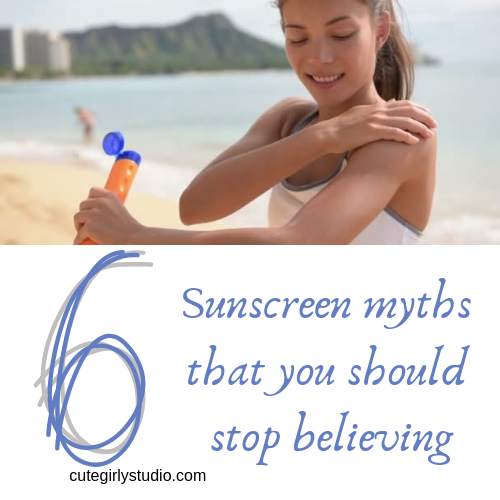 In this post, I have busted 6 myths about Sunscreen. NO. Not every other sunscreen protects us from UVA and UVB rays. Only Broad spectrum sunscreen can protect us from both UVA and UVB rays. If the sunscreen can protect your skin from 97% of UVB rays, it will be labelled with SPF30. The + symbol after PA will determine the protection against UVA rays. So look SPF and PA++ symbol while purchasing the sunscreen. Sunscreen will be losing its potency after 1 year of manufacturing. Never buy or use a sunscreen that has been manufactured before a year. Older the sunscreen, lesser will be the ability to protect against the UV rays. Unfortunately, sunscreen cannot protect 100% UV rays, so your skin will tan even if you use a sunscreen. The difference is, if you use a sunscreen every day, your skin develops tan slowly. Many people think that layering products with SPF will add up the SPF value. If you use a moisturizer with SPF15 and a sunscreen with SPF30, you won’t end up with an SPF45. You can’t increase the Value of SPF by layering the products. NO. You should apply sunscreen even when it’s raining. UV rays can even penetrate through raining clouds and can damage your skin. So please use sunscreen on a daily basis despite the weather outside.